A couple people whose newborn babies were just diagnosed with Williams syndrome contacted me over the past few days. They found my blog and were comforted by the cute pictures and stories about Emmy, who has brought such incredible joy to our lives. When you first find out that your newborn baby has any kind of syndrome, it can be a devastating time. You were expecting the experience that you so carefully planned out in your mind (What to Expect When You’re Expecting, anyone?? That book certainly doesn’t talk about Williams syndrome!). And then you find out that the little person you just gave birth to had a secret when he/she was in your belly–and you had no idea. You Google the syndrome and find information that frightens you. There may be serious medical complications, and there will surely be learning disabilities. How could this little baby that you don’t even know yet come with a laundry list of possible problems? It’s the biggest shock of your life, and you’re not even sure where to begin. And here is where the wedge comes in. A barrier sinks down in between you and your baby, and it’s completely out of your control. You want so badly to lift that barrier. You want to stop the rush of feelings that come at you every day (sadness, guilt, anger, confusion). You want SO BADLY to accept this baby. You want to just “get over” what you’re feeling. What can’t I stop thinking about this syndrome? And then you wonder…When will it get better? When will I stop feeling like an awful person and begin to embrace this diagnosis and accept my own child? I think we’re expecting a lot from ourselves. We had a certain vision in our mind. That vision was completely turned upside down, and we expect ourselves to just “get over it.” There’s actually a grieving process that needs to happen. You need to grieve the loss of your original vision–the perfect plan that you had in your head. You need to allow yourself to feel every single feeling that comes your way–without passing judgment on yourself. And then, with time, that barrier will start to lift. You feel yourself getting drawn into your child. You stop thinking about Williams syndrome as much. You start to really fall in love with who your child is becoming. Those old visions that you once had are now replaced by new visions and plans. You get excited at your child’s potential. You see your child blossom into a sweet, loving person, and you can’t believe your luck. You were given this incredible child. You were given this opportunity to stand side-by-side with your child and watch him or her do amazing things. You were brought into a special world that not everyone gets to see. For me, it was Emmy’s personality that changed everything. Early on, I read that people with Williams syndrome have “a very endearing personality.” They have big smiles and are overly friendly. I clung to those words as if they were my life raft. Everything else I read seemed scary. But “endearing personality” and “friendly” were music to my ears. Please let this be true, I thought. And then came the big smile that turned my world upside down. HOW I LOVE THAT SMILE!!! That was a Williams syndrome smile, and it was big and beautiful and bright. It was a glimpse into her personality. The next thing to emerge was the friendliness. We’d be sitting at a restaurant chatting away, and then someone at a nearby table would squeal with delight. I’d look over, and a woman would be waving to Emmy and saying to a friend, “She’s so cute! 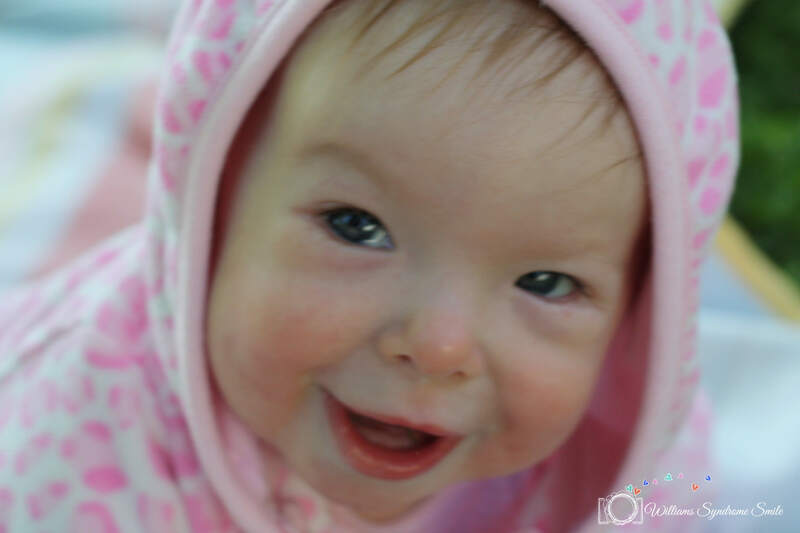 !” I’d look at Emmy, who was happily waving back and grinning. The thing is that she knows she’s cute. She knows exactly how to draw you in. First it’s the smile, then it’s the narrowing of her eyes and the tilt of her head, and now it’s followed by a phrase. She might say, “Hi. How you doing?” or she’ll call out, “Hi, kids!” or she’ll even blow you a kiss. I mean, she KNOWS what she’s doing, folks. She KNOWS that smile is pure gold. She’s also very funny. If you ask her an obvious question (like “Is that a shoe?”), she’ll give you an exaggerated but joking “Noooooooo.” And then when you respond, “No? Are you sure? ?” She’ll say “Nooooooo” again, just to get you to laugh. She knows it’s a shoe, but she’s pulling your leg. 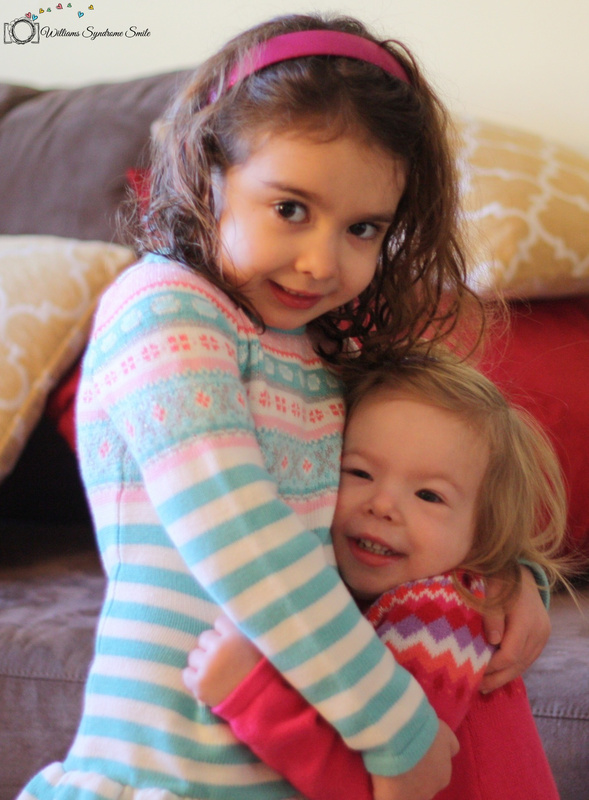 And she loves to chase her sister around the house while saying nonsense words like “Beebee beebee beebee.” Charlotte will run away from her laughing until, finally, both girls collapse in a giggling heap on the floor. It’s so much fun to watch. So to the newly diagnosed I say: Wait. And then, as the days, weeks, and months pass, things will change within you. You will connect with your child. You will fall in love with your child. You’ll be bragging about how wonderful he is. You’ll be glowing, fresh from the thrill of something new that she has done. And, even though you didn’t sign up to travel this road, it will feel as if this was meant to be–all along. These two have become inseparable, and that makes me so happy. The backstory here is that, during my pregnancy with Emmy, I constantly fantasized about the relationship between my daughters. My sister and I are very close, and I could only imagine how strong the bond would be between Charlotte and Emmy. I imagined them just like my sister and me–sharing secrets and giving advice. My weaknesses are my sister’s strengths. She’s six years younger than I am, but she’s often stepped into the big sister role on my behalf. I used to be painfully shy, and I would be terrified to return anything to a store. When I was fourteen and she was eight, my little sister marched into a music store on my behalf, walked right up to the register, and said, “Hi. I need to return this CD please.” I cowered towards the entrance of the store and peered around the aisles to see how the return was going. She came back triumphant with the money in her hand. I was always amazed at how easy she made it look. In a way, it was embarrassing to rely on my little sister. But I was also glad that I had someone in my life who would stand by me–no matter what. I feel as though we have an equal give and take, and I value that so much. And I saw the same for Charlotte and Emmy. Then we found out about Williams syndrome, and all my visions of replicating the bond that my sister and I have went right down the drain. I just didn’t know anything about Williams syndrome. I didn’t know how Emmy would act or talk or think. It was an enigma. Would she be able to offer her strengths for Charlotte’s weaknesses, as my sister has done for me? Would she be able to give career advice? Would she know how to keep secrets? Would she even want to keep secrets? And how would Charlotte feel towards her little sister? Early on, I started looking for stories about people who have siblings with special needs. I did find some very sweet stories. But I also found other stories–ones about feeling ignored by parents or resentful and angry. I found one story that really shook me. It was about a boy who was so embarrassed by his sibling with special needs that, instead of standing up for him, he joined the bullies in their taunting. Every day after school, a few bullies and his own brother made fun of this little boy as he walked home. GOOD GRIEF!!! That was hard for me to digest. If your sibling won’t stick up for you, who will? That positive spin really, really helped me. And as the years have passed, this younger-version sisterly bond has grown very tight. When Emmy was a baby, she and Charlotte had the typical baby-toddler relationship. 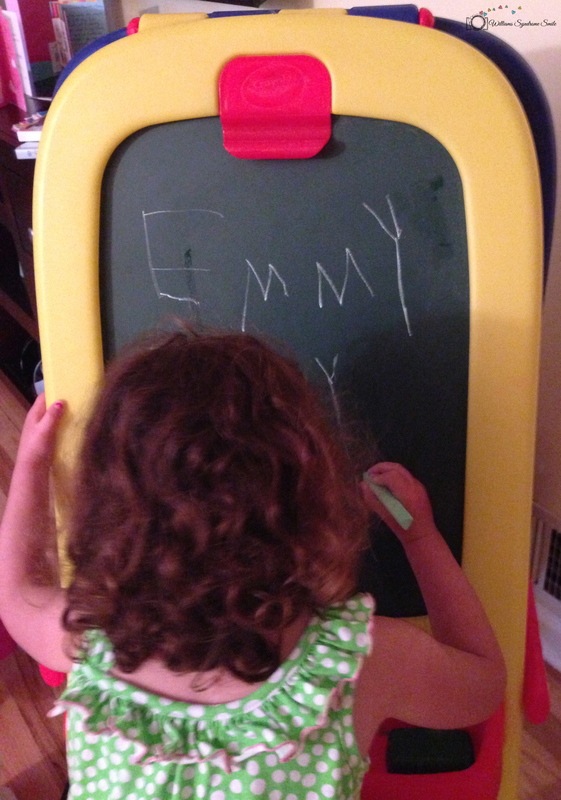 Sure, Emmy was cute, but she wasn’t able to communicate yet and cried…a lot. And now, as Emmy has become more verbal, they really have fun together. They playfully tease each other with high-pitched voices, they laugh and roll on the floor, they tickle, they share toys, they draw together; they hold hands. And Charlotte is such a good cheerleader too. “MOMMY! DADDY! You won’t believe what Emmy just did! !” She’s so proud when Emmy hits little milestones, and she really notices those milestones, just as we do. At almost five years old, Charlotte has started to develop fears (monsters, darkness, bugs). And wouldn’t you know that two-year-old Emmy has become her protector? If Charlotte is afraid to go to sleep at night, I say, “Don’t worry. Emmy is right here. She can protect you from anything.” And that seems to work! On her end, Emmy just adores her big sister. We were at the hospital the other day, and someone who works there was named Charlotte. Well, every time Emmy heard “Charlotte,” she looked around frantically and asked for her sister. Also, Emmy is eager to show her big sister any new thing. If she puts on funny sunglasses or finds a sticker or opens a book, the first person she wants to show is Charlotte. At the dinner table, Dan and I just watch the two of them banter and giggle. 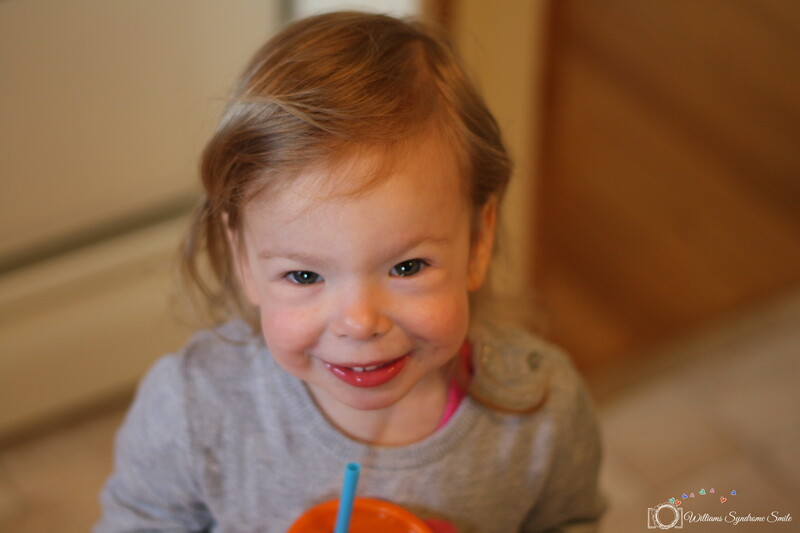 There isn’t much eating going on (Charlotte is repulsed by my food most of the time…), but there is a lot of laughter. It will be interesting to see how their dynamic evolves when a little boy arrives in June. Right now, I am so happy with how close they’ve become. It’s better than I even imagined.